Get even more power from this SaltDogg 92440SSA Under Tailgate Standard Discharge Salt Spreader that is equipped with two powerful motors offering maximum performance. Spread at width of 40 ft with a 6 inch auger to get your job done quickly. And a 10-gauge trough allows easy access to the auger for servicing, clean and cleanouts. Construction Material: Made out of stainless steel for durability and maximum performance. Spreading Width: Spread at a width of 4-40 ft. to cover more ground quickly. Motors: Two 12V DC Direct Drive Motors. 0.75 Auger motor HP and 0.5 Spinner Motor HP. Hydraulic Safety Lockout System: Added safety is guaranteed with the hydraulic safety lockout system. 6 inch Auger: Maximum flow is offered with the 6 inch auger to cover more ground quickly. 10-Gauge Trough: Easy access to entire auger for one person cleanout and a 3 point hinged bottom cover for easy access. 15 inch Side Shields: Side shields direct the flow to the auger to keep maximum flow. 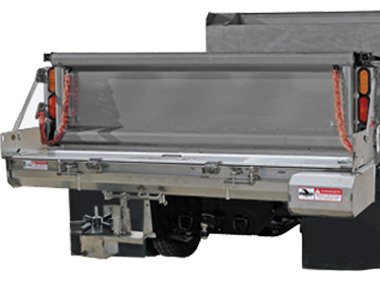 Ask us about the SaltDogg 96" Under Tailgate Electric Drive Spreader. Please no repair questions. Your Q&A may be posted to SnowblowersAtJacks.com to help other shoppers, like you, with their purchasing decisions. Thank you.